When we pray big, and the request is not granted (and this happens more than not) we have been taught to walk away, trusting that the outcome was simply God’s plan. We are therefore attempting to read the mind of God. I think it is healthier to explore the question and possible alternative answers rather than jumping to conclusions about what God intended, or to fear that God is not there at all. The other reason that it is hard for people to take this path of curiosity is because it feels like the issue we are considering is God’s ability. If you want to piss off a bunch of Christians, or Muslims, I dare you to raise questions about God’s ability. But that’s NOT what this discussion is about. Yes, one possible answer to the question is that God is not powerful enough to fulfill the request. However, a limited God opens up a whole other can of worms that lead to another dead end. So, for my discussions, God having limited power is not even under consideration. It has been a while since I read it, but the book by Harold Kushner, When Bad Things Happen to Good People, seems to reach this conclusion of a loving, but limited God. The question I raise is God’s method or intent. If I believe in a loving God who holds all the puppet strings to fate, and then I am cursed with a terrible fate, it begs the question of what the hell happened? I will quickly acknowledge that I will never know the full answer but this exercise in curiosity is yet not in vain. I think far too many, well-meaning people, bury these experiences and go on with their life, but deep inside they no longer love or trust God anymore. I think, and now I am reading God’s mind a bit, that he prefers a Jacob who wrestles with him than the person who walks away burying their questions within, just to avoid a struggle. 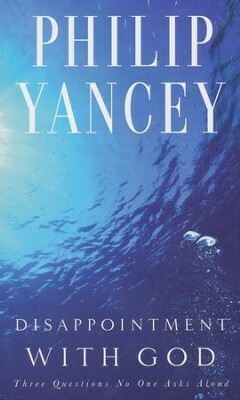 In Phillip Yancey’s book, Disappointment with God, he starts with a story about a promising theological student at a major evangelical university. This student was very impressed when a story about a man being super-naturally healed from an incurable cancer. He visited the man to interview and record his great testimony of faith and answered prayer. Then he called the man’s wife for a follow up interview weeks later and the man was dead. He died from his cancer, although his story of a super-natural healing was passed around and around the evangelical communities of Chicago. This theology student was so disappointed in God that he piled all his bibles and theological books on his grill and set them on fire. The fire was so huge that the fire department was summoned. He left his Christian faith, never to come back. I will bring up one more comment, before I let this thought rest for tonight. I have to remind people that I started my faith journey as a hard-core evangelical, for 20 years. I remember the man who introduced me to Christianity told me, A) If I live faithfully, God will build a hedge around my life and my family’s life and we would be spared from horrible things like cancer. He also said B) Like him, I will probably never see death because Jesus was coming back in 1985, or was it 1986. This was a prosperity type of Christianity. We also believed that supernatural miracles were common, very common. We (the group I was in) gave constant testimonies of great miracles that we had witnessed. Healing from cancer was minor league of the things we thought we saw. Then one day (the substance of my Butterflies in the Belfry) God opened my eyes that we were all living in a make-believe world of smoke and mirrors. We were habitual liars, faking miracles, faking attitudes and doing whatever we could to make ourselves look more righteous than other people. I would not call it a cult, but a toxic evangelicalism. I walked away from that world because I wanted to be more authentic. Now, when people say to me (as if I were born yesterday), “Oh, Mike, you should see all the miracles God is doing in my church or my group.” I want to run away. Been there, done that, it doesn’t work for me. When I worked though all of this 29 years ago, I reached the conclusion that if I can’t find God by being extremely honest, intellectually, then I certainly didn’t want to find him within bizarre world of a fun house of mirrors. I will always try to conclude these thought-sessions by reminding myself and others, I will never know the answers because they are not knowable. That God is surrounded in mystery that mortal minds cannot digest. In the meantime, I continue to pray my heart out and I want other to do the same. But my curiosity still drives me to consider the possibilities. I really appreciate your honest ramblings and rumblings as it were. I can relate to your evangelical past. It seems you’ve run into a number of people who “require” a God of little mystery and lots of certainty. Though your journey is yours and certainly different than mine, it reminds me of a time in the mid 90’s when I came to the realization that the heart of what I’d been taught wasn’t working. I’d been led to believe that if I could muster up enough faith or pray the right prayers that God would come through for me in the ways I expected and hoped for. I thought I could rise above and minimize the struggles I faced if I worked hard at polishing up my faith and making it more palatable to God. Then a wise person told me that the point was not to avoid the struggles but to come know God in the midst of my struggles. I believe they said that that is where He is most deeply known. It was a real shift for me to move from trying to figure out the right dance to get God to deliver the goods and simply to want to know the great mystery that He is. I have found with every passing year the mystery gets bigger and I feel less certain that I know much of anything about this great, kind king who wants relationship with me. In my mind, limiting our questions about Him seeks to make Him small. He welcomes our questions and doubts. All of them. And I am certain He will pursue us relentlessly no matter how great our doubts. Anyway, just wanted to thank you for speaking out of this most vulnerable place as we pray for your kidneys to come back to life and for health and healing to come. I wish life weren’t requiring so much of you. Praying your strength and stamina will be restored. Love you, good man. I would like to here your story sometime. Wouldn’t it be great to share such sitting around a campfire up in the mountains? That must have been difficult. One of my fears was that some of my kids would become bitter or disillusioned if something happened to me. It’s a good story and I say “YES!” to a campfire conversation! Praying for you most every day to encounter hope along this hard road you’re on. My dear smart gram, once told me when I questioned something in the bible. “That’s when you just have to have faith! Stay strong!